Every Grimas product has its own label. The label states the ingredients used for that specific product. This also applies to the pigments and colorants. Grimas does not use collective labels. All products manufactured by Grimas have a symbol showing a hand in an open book. This symbol means that further information is available about the product. This information can also be found in the Product Information and Examples on the Grimas website. All Grimas products are marked with the name Grimas, the postal address, country of origin (Netherlands) and the website address, so that not just the company but detailed information about the products can be easily found. All Grimas products are marked with the weight or volume in grams or millilitres. 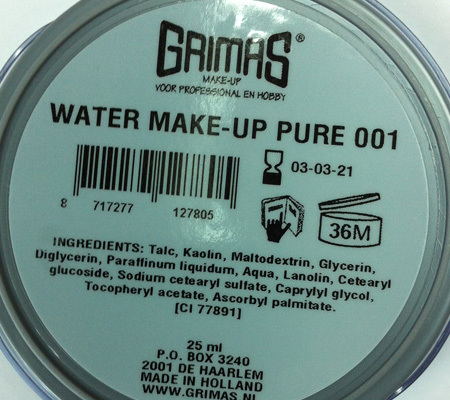 The Grimas website also lists the content in millilitres for each colour and size for Water Make-up Pure, converted into grams. This is intended as an extra to assist people who want to quantitatively compare brands of water-based make-up. The 'shelf life after opening' symbol, which states a number of months, tells the user how long the cosmetic product can be used for after opening. The hourglass and the date (day, month, year) indicate the expiry date ('guaranteed until at least...'). The expiry date on Grimas product labels is also the batch code. You can use this batch code to find out the specific list of ingredients for the product in question on the Grimas website. Ingredients are indicated by their INCI names. INCI is the abbreviation for the International Nomenclature for Cosmetic Ingredients. This international naming convention ensures clarity. It allows end users to see which ingredients have been processed in a product. This may be useful if you are allergic to a certain compound. We list the ingredients of make-up that we produce on the packaging along with the maximum percentages used under the Colours, Sizes, Ingredients headings that can be found in the 'Product information'. The ingredients that are present in the product in the greatest proportions are listed first. The ingredients that are in the product in smaller quantities come next. Ingredients that are present in the product to less than 1%, are listed in random order at the end of the list. Pigments and colorants come at the end of the ingredients list, even if they are used in large quantities. Pigments and colorants have a CI code. CI is the abbreviation for 'Colour index'. All Grimas products are unperfumed. Lipstick (Pure) and Gloss do contain a flavouring (fruit essence mix). Because flavour essences were also covered in European law by the term 'perfume', Grimas was obliged to declare the flavour essence as a scent, while strictly speaking they are not perfume compounds. European law now distinguishes between fragrances and flavourings, which is why the flavour essences have been called 'aromas' since January 2015 and are indicated as such on the packaging. The term 'nanoparticles' refers to particles smaller than 100 nanometres. One nanometre is a billionth of a metre. The EU Cosmetics Decree now requires ingredients used in nano-sized formats to be marked with '(nano)' on the packaging. Grimas uses silica in nano-sized format. Silica is finely ground silicaceous sand. Silica (nano) is used in Anti Shine, Blood Capsules and Tooth Enamel. Because more and more nanomaterials are being used, further research on the safety of these materials is being carried out in Europe. For eyeshadow labelling, for example, it is permissible to use one and the same label for all tones and to summarize all colorants used anywhere in the entire range, phrasing it as “may contain...”. A collective label means you can never be sure exactly which colorants are in which products. Grimas thinks it is important to give more specific information. This is important to people who get allergic reactions to certain colorants, for example. Grimas puts an hourglass on the label as standard so that the user knows the date until which the product is guaranteed to be good. In addition, this statement always allows the user to be sure that the product is not beyond its expiry date.